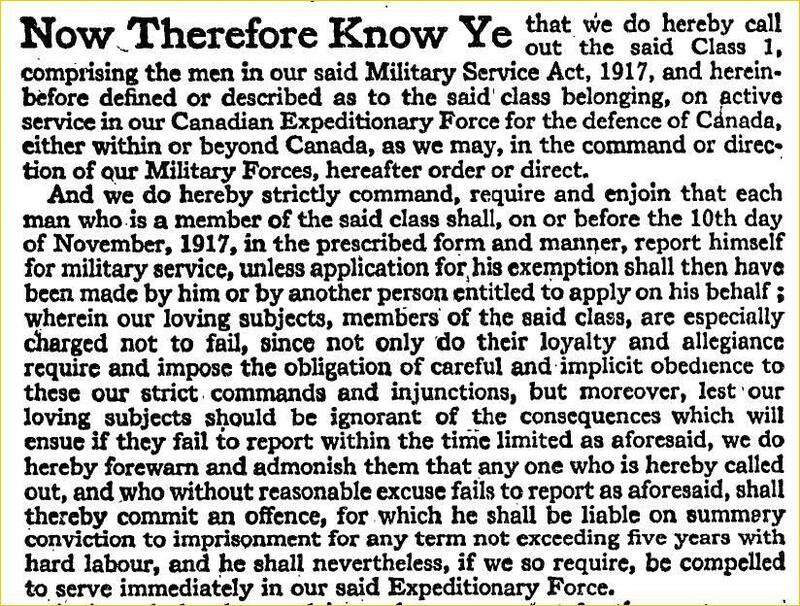 On this day, 13 October 1917, a Royal Proclamation signed by Canada’s Governor General, his Grace the Duke of Devonshire, was posted in newspapers and public places across the land. This Proclamation called "out the men comprised in Class 1, as described in the Military Service Act, 1917, i.e. male subjects who are or were residents in Canada "at any time since the 4th day of August 1914 . . . who have attained the age of twenty years, who were born not earlier than 1883, and were on the 6th day of July, 1917, unmarried, or are widowers but have no child," to report for service no later than 10 November 1917, or apply for an exemption. Exceptions included the clergy and those men who had already served "in any theatre of actual war, and have been honourably discharged therefrom." There were six grounds for exemption. Basically one could be exempted from service if his work was deemed to be "in the national interest" a controversial criterion that was abused and misinterpreted by local exemption tribunals across the country and nearly proved to be an Achilles heel for implementation of the Military Service Act. This was a historic first for Canada – the first time its citizens had been compelled to perform military service. The penalty for men in Class 1 who did not obey this summons was severe; it could include imprisonment and hard labour for up to five years. Initially, over 25,000 men did sign reports for service. However, across the country, the vast majority of potential conscripts (over 93 percent) elected to seek an exemption from service. Hundreds of thousands would be granted such an exemption, but in 1918 would revisit this provision with near disastrous results.